Many asked, and I listened! 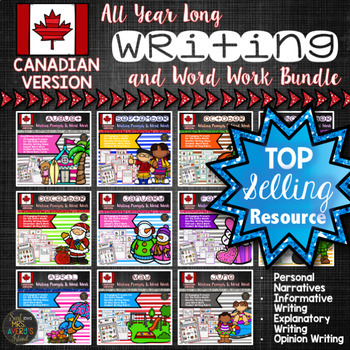 I have had countless teachers from Canada request that I take my top selling year long writing prompts and word work bundle and offer it in a Canadian version! I'm so excited to say I have collaborated with a teacher from Canada and made that happen! 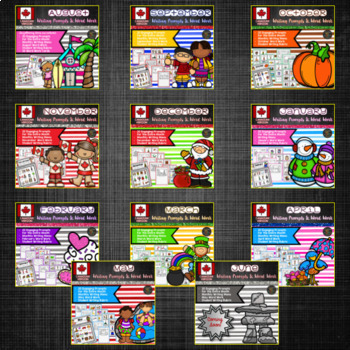 Click the link to see what many other Canadian teachers have to say about this year long writing and word work bundle! Perhaps you can decide if you think this Canadian version would be a good fit for your students. 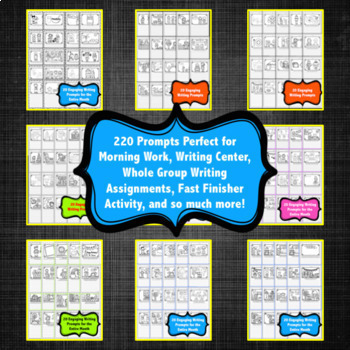 The writing prompts can truly be used with any elementary grade level simply by aligning your grade level's writing standards and expectations to the writing prompts. The bundle also includes lined pages with three different writing widths to accommodate younger and upper elementary students. 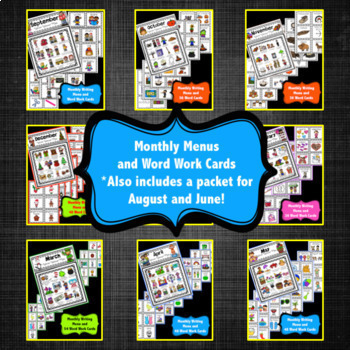 ♥MONTHLY MENUS: These menus are intended to be printed, laminated, or inserted into a sheet protector, and placed in the writing center for students to access if they are at a loss of writing ideas. We sure don’t want our students spending 10 minutes of their writing time “THINKING” about what to write; therefore, these writing menus can ignite their thoughts. ♥WRITING RUBRIC: A student friendly rubric for students to use in order to evaluate their writing samples. The rubric is in a “yes/no” format. Your students can simply check the boxes as they apply. ♥AUTHORS WITH AUTHORITY: This is a great writing tool for students to keep in the front of their writing journal or in their binder! It is full of friendly writing tips that students often misuse. As the year unfolds, you can individualize the scaffolding of these pointers…fewer skills for students below grade level, and additional skills for students on or above grade level. These guidelines can be introduced based on the developmental age of your students or ability level. Some ideas for you, the teacher, that will allow you to keep your sanity while managing your writing station. An attractive and well stocked writing station is a key component that will create an inviting atmosphere for your students. ✎ Make sure extra erasers are available. when illustrating while they are at the writing center. ✎ Have a designated folder for students to place finished work. Thank you in advance for respecting my time, effort, and money used to make this resource possible and for purchasing additional licenses for any colleagues you plan to share this with. ©Kelly Avery & Mrs. Avery’s Island. All rights reserved. Purchase of this product entitles the purchaser to reproduce the pages for ONE CLASSROOM ONLY. Duplicates for more than one classroom such as another teacher, grade level, school or district is strictly forbidden without written permission from the author, Kelly Avery. Copying any part of this product and placing it on the Internet in any form is strictly forbidden and is a violation of the Digital Millennium Copyright Act (DMCA). You may show how this product was used on your website or blog as long as you provide a link back to my TPT store. If you are interested in saving money on your future TPT purchases, please leave me some feedback on this product after you have had a chance to look it over or use it with your students. Did you know that when you leave feedback on your products you earn TPT credits? Many people are not aware of this TPT perk, so I wanted to share it with you! After you rate the resource and leave feedback, you earn a TPT credit. These credits accumulate and can be redeemed on your future TPT purchases!! Not to mention, your feedback provides other teachers valuable information when they are deciding on purchasing a resource! So please share your love and any details if you used this resource in a different/creative way! I ♥ my followers! *All resources are 50% off for the first 24 hours! By following me, you will receive a notification when new resources are added! I love offering special discounts and freebies as a thank you to my followers too! Whether you are visiting my store today or making a purchase, I encourage you to click my star and become a follower if you are not already! *Already discounted bundles and custom resources are excluded from being 50% off when uploaded.